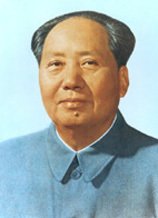 Mao Zedong (1893-1976), Chairman of the First National Committee of the Chinese People's Political Consultative Conference (CPPCC) and Honorary Chairman of the Second, Third and Fourth CPPCC National Committees, styled himself Runzhi, a native of Xiangtan, Hunan Province, studied in Hunan Provincial No. 1 Normal School. In April 1918 he organized the Xin Min Society in Hunan Province. In 1919 he founded the Xiangjiang Review and served as its chief editor. In the autumn of 1920, he established the Communist group in Changsha City. In July 1921 he attended the First National Congress of the Communist Party of China (CPC). In August he served as director of Hunan branch of the Secretariat of the Chinese Labor Organization. In October he served as secretary of Hunan provincial CPC branch. In 1922 he served as secretary of the Hunan Region CPC Executive Committee. In June 1923 he attended the Third National Congress of the CPC and was elected member of the Central Executive Committee and the Central Bureau and secretary. In the early 1924, he participated in the CPC's help to Dr. Sun Yat-sen in reorganizing the Kuomintang (KMT), attended the First and Second National Congresses of the KMT and was elected alternate member of the Central Executive Committee. In 1925 he served as Acting Director of the Department of Propaganda of the Central Committee of the KMT and edited the Political Weekly, organ of the Central Committee of the KMT. In 1926 he ran the Training Institute of the Peasant Movement for the sixth group of students. In November of the same year, he served as Secretary of the Peasant Movement Committee of the CPC Central Committee. In April 1927 he attended the Fifth National Congress of the CPC and was elected alternate member of the CPC Central Committee. In June he served as secretary of Hunan provincial CPC committee. On August 7, he attended the meeting held in Hankou and was elected alternate member of the Provisional Political Bureau of the CPC Central Committee. After the meeting, he was sent to the Hunan-Jiangxi border area to lead the Autumn Harvest Uprising and served as secretary of the leading body for the uprising - the front committee. In September the Autumn Harvest Uprising broke out. Afterwards, he led the insurgent troops which arrived at the Jinggang Mountains, launched the agrarian revolution and established the first rural revolutionary base area - the Jinggang Mountains Revolutionary Base Area. In April 1928 he joined forces with the insurgent army led by Zhu De and Chen Yi, established the Fourth Army of the Workers' and Peasants' Revolutionary Army and served as secretary of the CPC Military Commission and Party representative. At the First Representative Conference of the Hunan-Jiangxi Border Area held in May, he was elected secretary of the Hunan-Jiangxi border area special CPC committee. Later, he served as secretary of the CPC front committee of the Fourth Army. At the Sixth National Congress of the CPC held from June to July of the same year, he was elected member of the CPC Central Committee. In June 1930 he served as political commissar of the First Army Group of the Red Army and secretary of the CPC front committee. In August he served as general political commissar of the First Front Army of the Red Army and secretary of the CPC front committee. At the Third Plenary Session of the Sixth CPC Central Committee held in September, he was elected alternate member of the Political Bureau of the CPC Central Committee. In 1931 he served as member and acting secretary of the CPC Central Bureau of the Soviet Area, vice-chairman of the Revolutionary Military Commission of the Party Central Committee and director of the General Political Department and chairman of the Provisional Central Government of the Chinese Soviet Republic. In January 1933 he was elected member of the Political Bureau of the CPC Central Committee and led the Red Army in the Central Soviet Area to crush the First, Second and Third "Encirclement and Suppression" Campaigns launched by the KMT troops. In October 1934 he took part in the Long March. In January 1935 he attended the Zunyi Meeting and established his leadership over the Red Army and the Party Central Committee. After the meeting, he, Zhou Enlai and Wang Jiaxiang formed the Group of Three to take charge of military operations. Afterwards, he vanquished Zhang Guotao's splittism during the Long March, led the Red Army in arriving at northern Shaanxi in October 1935 and created a new situation in the Chinese revolution. In early November of the same year, he served as chairman of the Northwest Revolutionary Military Commission. In December 1936 he served as Chairman of the Revolutionary Military Commission of the Central Committee. At the enlarged meeting of the Political Bureau of the CPC Central Committee held in Luochuan in August 1937, he served as Chairman of the Revolutionary Military Commission of the Central Committee. In 1942 he led the entire Party to conduct the rectification movement in Yan'an. In March 1943 he served as Chairman of the Political Bureau of the CPC Central Committee. At the First Plenary Session of the Seventh CPC Central Committee held in June 1945, he was elected Chairman of the CPC Central Committee, its Political Bureau and its Secretariat. After the victory in the anti-Japanese war, in August 1945 he was accompanied by Zhou Enlai to go to Chongqing to hold peace negotiations with Chiang Kai-shek to maintain domestic peace. In the summer of 1946, the full-scale civil war broke out. He led and commanded the great People's Liberation War with other leading comrades of the CPC Central Committee. At the First Plenary Session of the CPPCC held in September 1949, he was elected Chairman of the Central People's Government of the People's Republic of China and was appointed Chairman of the People's Revolutionary Military Commission of the Central People's Government. On October 1, he proclaimed the founding of the People's Republic of China at Tian'anmen Square in Beijing. Afterwards, he led the entire Party and the people all over the country in the recovery of the national economy, all democratic reforms, the War to Resist U.S. Aggression and Aid Korea and the socialist transformation of agriculture, the handicrafts and the capitalist industry and commerce. In 1954 he took charge of drafting the first Constitution of the People's Republic of China. At the First NPC held in September of the same year, he was elected President of the People's Republic of China and Chairman of the Military Commission of the CPC Central Committee. From October 1949 to December 1954, he served as Chairman of the First CPPCC National Committee. From December 1954 to 1976, he served as Honorary Chairman of the CPPCC National Committee. In 1956, 1969 and 1973 he was elected Chairman of the Eighth, Ninth and Tenth CPC Central Committees. His major works are included in the Selected Works of Mao Zedong and the Collected Works of Mao Zedong.